I picked up an interesting bit of information today about the Fuller's London Brewers Alliance programme. This is a great tie-up which sees Fuller's pubs showcase beers from other London Brewers Alliance members, and all kudos to Fuller's for running it. What I hadn't really realised until I was chatting with one of the staff in the Mad Bishop & Bear at Paddington station today was just what a challenge this is for some LBA members. The programme only runs in 15 Fuller's pubs, but even so it requires the brewer to commit to supply 70 firkins of the chosen beer. This is to allow the pubs to order multiple casks – the bigger ones might take eight, for example. That's a lot for a small brewery – the typical 10-barrel brewkit produces 40 firkins at a time, while for smaller breweries such as A Head in a Hat's five-barrel plant at the Florence in south London, it means brewing the same beer four times. This makes it quite impracticable for some, if they don't have the spare capacity. I mention A Head in a Hat because that's who is supplying the March LBA beer, and the Mad Bishop has it on sale already. 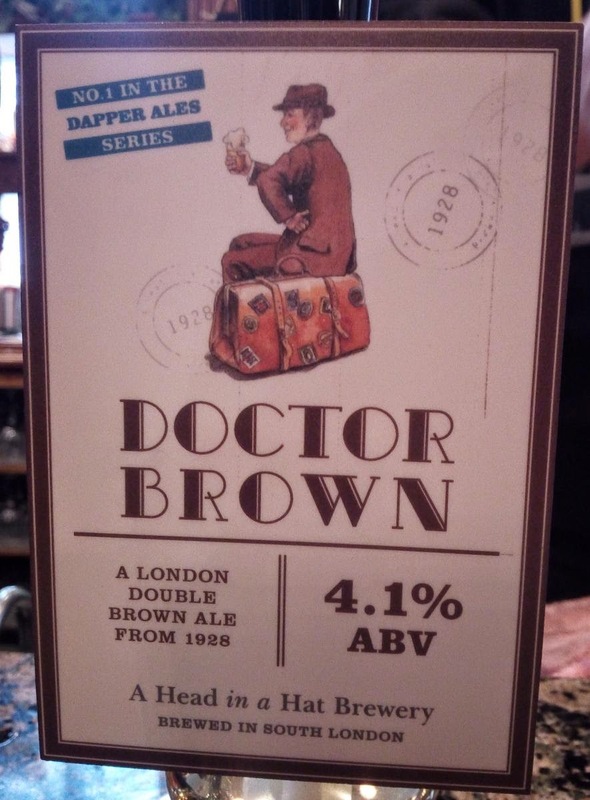 It's Dapper Ales' Doctor Brown, a recreation of a 1928 double brown ale brewed in London by Barclay Perkins, and named after Dr. Samuel Johnson, who was a great friend and benefactor of the Thrale family who founded the brewery that became Barclay Perkins. Dapper Ales is a new series of beers, produced in collaboration between two beer historians, A Head in a Hat's Peter Haydon, and Home Brewer’s Guide to Vintage Beer author and fellow blogger Ron Pattinson. Peter has attempted to recreate the beer as faithfully as possible, going back to original boil times, and parti-gyling the wort streams. The original hops used were Pacifics, Bramling, Fuggles and Golding, and care has been taken to get as close as possible to this original bill. American Cluster are what would have been meant by Pacifics, and while Bramling is no longer grown due to its disease susceptibility, its daughter Early Gold is, so that has been used instead. The result is a rich and toasty ale, deep red-brown with touches of smoke and tart red fruit, and a burnt-bitter caramel edge. An excellent example of an English brown ale, I suspect, and well worth seeking out. Addendum: And as Ed quite rightly points out in the comment below, one opportunity to seek it out is when Peter and Ron get together on Saturday 28th March from 3pm to formally launch the Dapper Ales project. I would very much like ot be there, but sadly I'll be out of town.